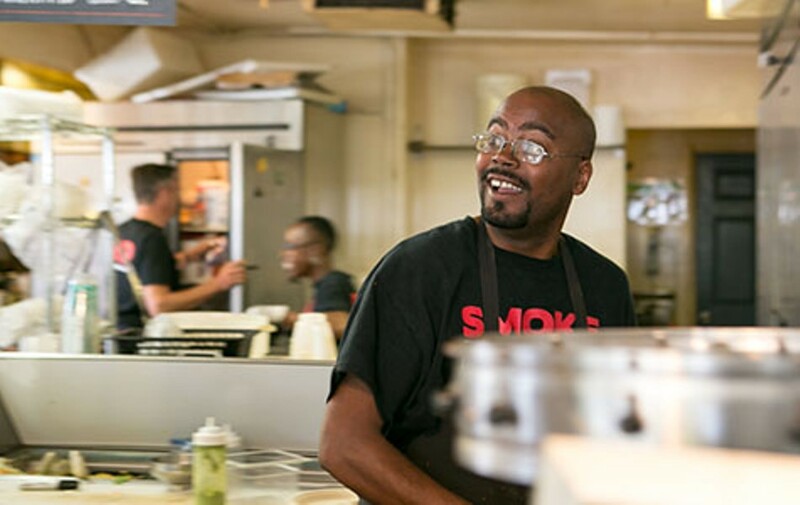 Bert Johnson Michael Rachal said the job at Smoke Berkeley helped him turn his life around after prison. Bert Johnson Tina Ferguson-Riffe, Smoke Berkeley owner, provides second chances to people with records. When Michael Rachal began a job search four years ago, he quickly became familiar with the judgmental expressions on the faces of prospective employers. As soon as the 43-year-old Richmond resident was released from prison in May 2011, he began looking for work. But because he didn't want to lie on applications, he always checked the box that asked applicants if they had criminal records. "As soon as somebody sees that, it's like they don't want to have to deal with it," said Rachal, who spent ten months behind bars for a firearm conviction. "They would say, 'I'll call you in a week.' But I knew they were not going to hire me. They were not even going to give me a chance." After applying for more than twenty jobs, he eventually landed a position at Rubicon Bakery (RubiconBakery.com), a business that manufactures sweets in Richmond and sells them throughout Northern California. 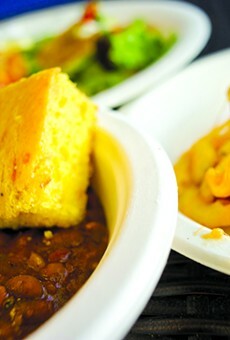 Later, he got a dishwashing position at Smoke Berkeley (SmokeBerkeley.com), a barbecue restaurant — at which he has since been promoted to pit master — in southwest Berkeley. 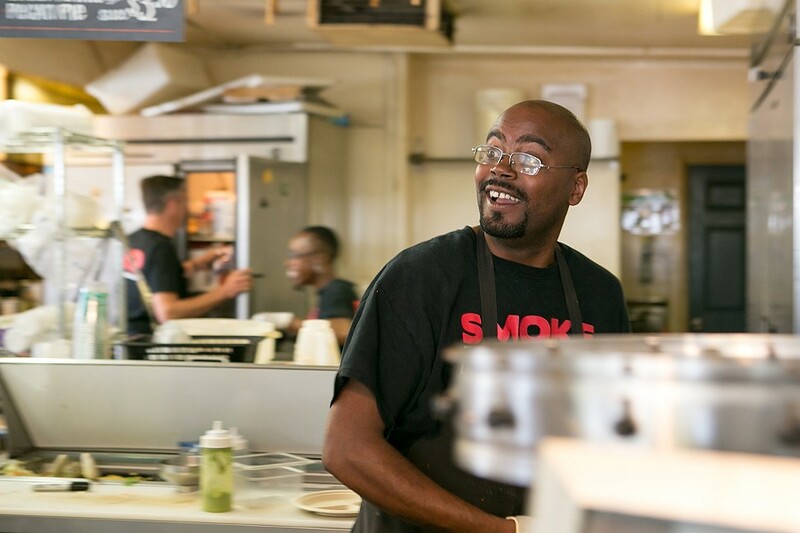 Rubicon and Smoke Berkeley are both part of a growing number of East Bay businesses that actively work to provide job opportunities to formerly incarcerated people and applicants with criminal records. Local civil rights advocates are increasingly pushing employers to not discriminate against applicants because of their past run-ins with the law. And community-oriented merchants who have adopted this fairer and more ethical approach to hiring say it's also a winning strategy for businesses. For starters, there are state and federal subsidies available for companies that hire people convicted of felonies. Additionally, a worker who has faced a steady stream of rejections due to a past conviction often is a uniquely dedicated and productive employee once he or she finally gets a job opportunity, advocates say. 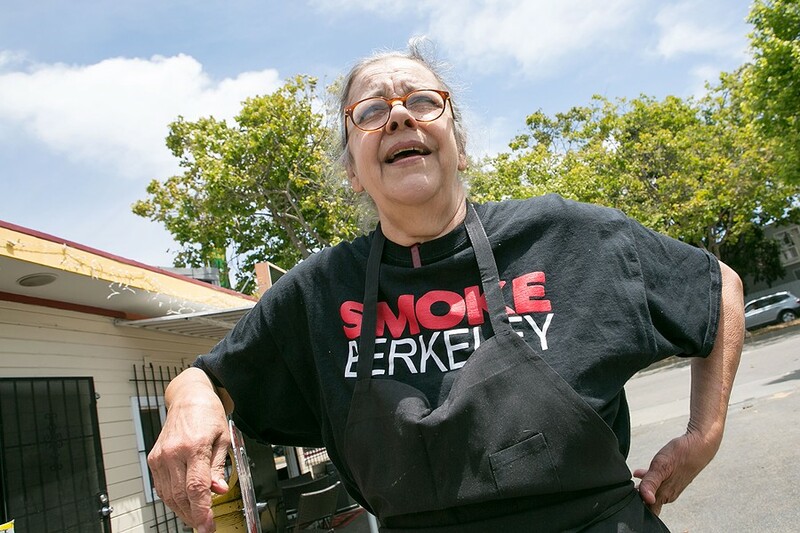 "It's really important to me that people do get a second chance," said Tina Ferguson-Riffe, owner and chef of Smoke Berkeley. "You can change someone's life." All five of her current employees have criminal records, she said, adding, "They know this is their home away from home. It's really a family team." Research has repeatedly demonstrated that stable job opportunities for people with past convictions and those reentering society are critical to building a strong local economy. And those jobs are especially important now as California continues to work to reduce the number of people in state prison. The Lawyers' Committee for Civil Rights of the San Francisco Bay Area and the National Employment Law Project have published significant data and resources for employers on so-called "fair chance" hiring practices as part of their joint campaign called A Good Hire (AGoodHire.com). According to data from those two nonprofits — which also recently spearheaded a related East Bay initiative, called Cultivating Fair Chance Employment in Alameda County — more than one out of every four adults in the country has a criminal record and nearly half of people in prison are serving time for nonviolent offenses. In Alameda County, roughly 375,000 residents have records. That means when businesses automatically reject applicants because of their records, they are missing out on a massive number of potentially talented employees. "Hiring people with records reflects our local community," said Jessica Flintoft, a Lawyers' Committee consultant who helped coordinate a business leaders summit on reentry in Alameda County last year. "Truly, businesses are missing out on talent when they exclude hiring people with records." And when these individuals are barred from jobs, it's bad for the economy and bad for public safety. Crime data has consistently shown that formerly incarcerated people are much less likely to re-offend if they have steady employment. "People are capable of changing if given the right opportunity," said Derreck Johnson, owner of the Home of Chicken and Waffles restaurant (HomeOfChickenAndWaffles.com/Restaurant.html) in Oakland's Jack London district. He estimated that 60 to 70 percent of his 44 employees have criminal records, including two managers who were previously convicted of felonies. He added: "Giving this population a chance, you'll find an extremely loyal person who is grateful for you and the business." At Give Something Back (GiveSomethingBack.com), an office supplies business headquartered in East Oakland near the Coliseum, providing jobs for people with felonies has been good for the company's bottom line, said co-founder and president Mike Hannigan. "The subsidies and tax credits make it a good financial deal for the company to invest in them." The groups behind A Good Hire published a detailed list outlining some of these financial opportunities in California and at the federal level — see Bit.ly/AGoodHire. For example, California's New Employment Credit provides a tax credit of 35 percent of wages for certain businesses that hire a full-time employee who has a felony record, and a similar federal program, the Work Opportunity Tax Credit, can save employers up to $2,400. For D and B Painting (DBPaint.com), an Oakland-based painting company, "fair chance" hiring simply means adopting a "don't ask" policy when it comes to past convictions of applicants. Donnie Royal, the company's business development representative, noted that the reentry process for people leaving prison is already filled with so many barriers. "The last thing D and B wants to do is tear them down again," he said, adding, "If we can eliminate that one component that stops them from wanting to move forward, then we've benefited society as a whole." D and B is currently in the process of launching a nonprofit affiliate, Building2Empower (Building2Empower.org), which will host job fairs and offer training programs for at-risk youth and formerly incarcerated people. Some ex-offenders are well positioned for employment, Royal added, noting that inmates can learn valuable skills in reentry programs behind bars and after they've been released. "Why not let them be able to display their talents outside?" A Good Hire has also published a helpful list of best practices for employer background checks — see Bit.ly/BackgroundCheckPolicies — which includes eliminating any outright bans on application forms, such as "no felons should apply." Businesses that do ask about convictions should limit inquiries to recent offenses directly related to job responsibilities — and should give applicants an opportunity to explain the circumstances or provide evidence that they have made progress, such as earning a high-school diploma or completing a job training program. The advocates further recommend that companies never make hiring decisions based on an applicant's infractions, misdemeanors, or arrests that are not followed by convictions. Stoloff said he is often inspired by his employees: "Somebody who has been in prison and made a very conscious decision and effort to turn their life around and start over approaches their job differently. It's very purposeful," he said. "They're there for more than just a paycheck."